Stupas are hemispherical structures which house Buddhist relics and are places of meditation for Buddhist monks. 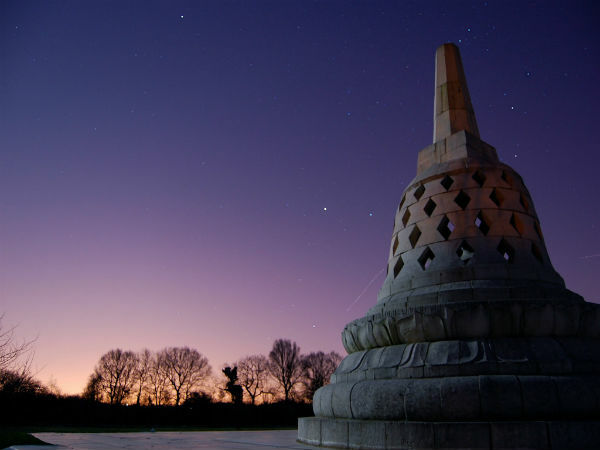 Stupa is said to have been derived from a Sanskrit word which translates to worship. The structure is developed as the nucleus of Buddhist faith and worship, with origins dating back to 2000 BC. Burial mounds which contain relics were constructed from earth and rock as per age-old customs, which have survived from as early as Neolithic times. These burial mounds were also common during Buddha's time and he is believed to have instructed his disciples to construct them in honour of great kings, sages and heroes. After the death of Buddha, a stupa was raised in his honour and eight great princes are said to have fought for his ashes and bones. These relics were, hence, distributed to the eight different kingdoms and stupas came to be erected over them. During the reign of Ashoka, they were redistributed and a portion of it is said to have been enshrined in the Great Stupa at Sanchi. During the rule of the Mauryas and the Guptas, the old stupas were renovated, of which three are noteworthy-the stupas of Bharhut and Sanchi in the state of Madhya Pradesh and the one at Amaravati in the state of Andhra Pradesh. Have a look at some of these ancient places of worship and visit them. The Great Sanchi Stupa is one of the best-preserved stupas in central India and is also the oldest stone structure in the country. The construction work of this massive structure was commissioned by the emperor, Ashoka the Great, in the 3rd century BC. Built as a hemispherical structure, to honour and provide shelter to the relics of Buddha, the stupa was declared as a World Heritage Site by UNESCO and is a protected monument. One of the most visited and worshipped Buddhist structures across the globe, Dhamek Stupa at Sarnath is one of the holiest sites for the followers of Buddhism. Sarnath is said to be the place where Buddha delivered his first sermon to his disciples after attaining enlightenment at Bodhgaya. The Chaukhandi Stupa is one of the most important stupas, which is said to have evolved from an ancient burial mound. The stupa marks the place where Buddha met the group of five ascetics, who later became his first disciples while moving from Bodhgaya to Sarnath. Now in ruins, the stupa is believed to have been built in the 4th-6th centuries, during the Gupta period, as a terraced temple. Also known as Mahachaitya, the stupa here is the biggest one to be found in the state with a diameter of 50 m and a height of 27 m, but, has been largely destroyed during the 19th century by local contractors to extract lime mortar. The foundation of this stupa is said have been laid by Mahadeva Bikshu who was an emissary to the great Emperor Ashoka, who was given the task of spreading the message of Buddha across the world. The stupa was built between 1983 and 1991 by the Japanese monks to mark the completion of 2500 years of Buddhism and to promote world peace. The Shanti Stupa is a giant white spired structure constructed atop the Chamspa hill in Leh. The structure attracts a large number of visitors not only for its religious values but also for its breathtaking views of the surroundings.